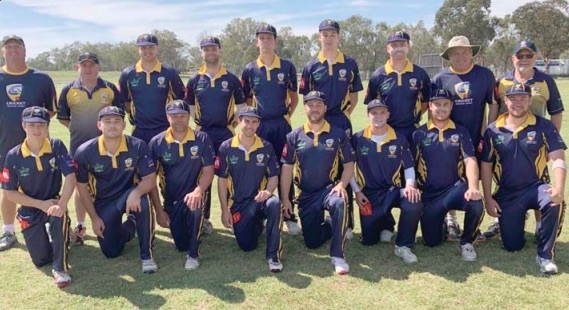 An unbeaten century by Kincumber-Avoca’s, Steve McCabe, has guided Central Coast to a 74 runs win over North Coastal, and a spot in the 2018/19 McDonalds NSW Cricket Country Championship Final. It was not easy for the Central Coast however, as they had to fight hard, first with the bat to record a very competitive 6/257 off their 50 overs, and then survive an early onslaught with the ball, before bowling North Coastal out for 183. After winning their first toss of the carnival and opting to bat first, Central Coast were in early trouble, with Saturday’s heroes, Adam Taylor and Tony Cornwall, both back in the sheds with just 11 runs on the board. Three further wickets saw the Central Coast reeling at 5/49. Enter McCabe and Wyong skipper, Hayden Murphy, who proceeded to not only stabilise the innings but to take control of the game. With sensible batting, the pair took the score to 176, a partnership of 127, before Murphy was dismissed for 63 off 77 balls. Youngster, Broc Hardy, then joined McCabe, and the pair were able to put together an unbeaten 81 run partnership to end the innings and set North Coast a very competitive chase of 268. McCabe finished on 118 not out off 140 balls, and used all his experience to be patient when required, but then also taking advantage of the loose ball which enabled him to hit 14 fours and two sixes. Hardy finished with 32 not out off 28 balls, with four boundaries, and was a foil for McCabe, and once again showed the talent the sixteen year old possesses. North Coastal began the chase in an aggressive manner, with, Justin Moore and Caleb Ziebel, carry on the form that saw them put on an unbeaten partnership of 262 on Saturday. The pair put on 45 off just six overs before, Scott Burkinshaw, removed the dangerous Moore. Ziebel and skipper, Richie Gallichan, then took the score to 123 before the game changed in the space of two balls. Firstly, Gallichan was caught and bowled by, Blair Lindsay, and then next ball, Ziebel was run out by a direct hit from Hardy for a well-made 71 off 71 balls. After taking four wickets, Lindsay again proved very effective with his left arm spin and he joined with keeper, Harry Woodhead, to pick up a further three wickets, which were interspersed by a second direct hit run out by Hardy. Burkinshaw then returned to the attack to pick up the final two wickets to send the Central Coast to the final. Lindsay finished with 4/27 off 8 overs, to be the most successful bowler, whilst Burkinshaw showed his NSW Country credentials throughout the weekend and was rewarded with 3/34. Chris Archer, Hayden Murphy and Adam Taylor, also all bowled well without any success. Central Coast fielding was a highlight, with three run outs proving very crucial. On now to the final, which will be played on Sunday, November 25, against the winner of the Southern Pool carnival.